Mixed traffic conditions characterized by the presence of different vehicle types and weak lane discipline are common in the developing world. Different maneuvering capabilities of different vehicle types lead to vehicle-type dependent longitudinal and lateral movement driving behaviors. Weak lane discipline allows drivers to simultaneously look for possible lateral movements while progressing longitudinally. This integrated driving behavior gives rise to various driving phenomena like tailgating, multiple-leader following, swerving and filtering. However, very few studies exist in the literature that attempt to model these typical driving behaviors of mixed traffic streams. Moreover, most of these studies are not often readily available. Thus, a comprehensive review of the studies that consider modeling driver behavior in mixed traffic conditions is presented in this paper. Often, models developed for mixed traffic conditions stemmed out of the basic principles employed in the development of homogeneous traffic models. Hence, this paper first reviews the lane-based macro-, micro- and meso-scopic models in tandem and identifies their strengths and weaknesses in describing the mixed traffic system. A thorough understanding and conceptualization of any system is possible by analyzing large sets of empirical data. Therefore, a brief review on traffic data requirements to understand and model the driver behavior and, data extraction tools to obtain the trajectories of vehicles is presented next. Driver behavioral models form the core of any microscopic traffic simulation model. Core behavioral models such as car-following and lane-changing models which describe the longitudinal and lateral movements of drivers respectively are reviewed next. However, these two behavioral models may not be able to describe the integrated driving behavior independently. Therefore, various integrated driver behavioral models are briefed next. A simulation framework is essential to implement the driver behavioral models and evaluate their capabilities in representing larger scale traffic systems. Hence, a brief review of various simulation frameworks is presented subsequently. Finally, the challenges that are involved in modeling driver behavior in mixed traffic conditions are discussed and some useful research directions are proposed. Analytical models can be used with acceptable confidence to reliably represent and understand the behavior of each entity and the interaction of a limited number of entities of a system. However, they may not be able to adequately describe the complex, simultaneous interactions of many system entities as in the case of a traffic system. On the other hand, this flexibility is offered by simulation models, but at the cost of high computational times. Nevertheless, with the advent of high-end computers, researchers in the recent past have adopted the simulation technique to provide effective and intelligent transportation solutions. Thus, a comprehensive understanding of various simulation approaches available to describe the traffic system is important. Time and again, models developed for mixed traffic conditions stemmed out of the basic principles employed in the development of homogeneous traffic models. Hence, this paper first reviews the lane-based macro-, micro- and meso-scopic models in tandem and identifies their strengths and weaknesses in describing the mixed traffic system. Analyzing large sets of empirical data helps in thorough understanding and conceptualization of any system. Therefore, a brief review on traffic data requirements to understand and model the driver behavior and, data extraction tools to obtain the trajectories of vehicles is presented next. The core of any microscopic traffic simulation framework are the driver behavioral models. The most essential behavioral models, car-following and lane-changing which describe the longitudinal and lateral movements of drivers respectively are reviewed next. However, these two behavioral models independently may not be able to describe the integrated driving behavior. Therefore, various integrated driver behavioral models are briefed next assessing their merits and demerits. A simulation framework is essential to implement the driver behavioral models and evaluate their capabilities in representing larger scale traffic systems. Hence, a brief review of various simulation frameworks available in the literature is presented subsequently. Finally, the challenges involved in modeling drivers’ behavior in mixed traffic conditions and some research directions are presented. Traffic flow models can be categorised as macro-, micro-, or meso-scopic depending on the level at which they represent the traffic flow. Macroscopic models take into account the movements of vehicles in groups or platoons to describe a traffic stream. Microscopic models predict the longitudinal and lateral movement behaviors of each and every vehicle in terms of speed and acceleration by considering the surrounding vehicles’ characteristics and the environment. Mesoscopic models use explicit mathematical relationships to describe the interactions between clusters of vehicles and thereby predict the traffic stream characteristics on the whole. A brief review assessing the strengths and weaknesses of each of the model class in the context of mixed traffic flow modeling is presented here. Macroscopic models use the deterministic speed-flow-density relationships to describe a traffic stream. Major approaches that have been proposed in the literature taking a macroscopic perspective are presented here. Until the queue disappears completely, the number of queued vehicles (n; dn denotes the change in number of queued vehicles) change according to Eq. 1. Both the capacity and inflow are time dependent in this description. Random distribution pattern of the arrival of vehicles causes time dependent variations in inflow. The possibility of vehicles arriving in platoons or the existence of large gaps between the vehicles can lead to fluctuations in capacity. The capacity also fluctuates as vehicles can arrive in platoons or there can be large gaps in between two vehicles. Vehicle-to-vehicle fluctuations are present on one hand. For instance, shorter headways are maintained by some drivers having a shorter reaction time leading to a higher capacity. Capacities also depend on road conditions on the other hand. For a given inflow-outflow curve, the fluctuations in the number of queued vehicles (n) is shown in Fig. 1. Some of the straightforward models that can be employed for the traffic flows are provided by queuing theory. However, these models normally consider the basic unit of traffic as a point. In reality, the lengths of vehicles as well as the safe distance maintained by successive vehicles are also included in vehicular queues. Thus, these models do not adequately describe the spatial aspect of traffic congestion in particular. On the other hand, models developed based on shockwave theory are capable of describing the spatial and temporal dimensions of queues accurately. In other words, the change in flow over the wave divided by the change in density equals the speed of shockwave. This description provides a nice graphical interpretation as depicted in Fig. 2. The slope of a line that joins two traffic states 1 and 2 in the principal diagram represents the speed of shockwave in time–space plane. The spatio-temporal dynamics of traffic streams can be predicted in a simple way using the theory of shockwaves. This theory replicates the traffic characteristics that are principally aligned with what are observed in reality, but it has its weaknesses too. Traffic continues to drive at critical speed even when it is away from congestion. In reality, it accelerates smoothly towards free speed. The phenomenon of hysteresis is not captured by this theory. The phenomenon of drivers choosing a different speed to accelerate from a specific deceleration for similar space headways is called hysteresis. The unprompted transitions from one state to the other may not be well described by this theory. More advanced approaches like continuum models that address the above limitations are discussed here. Traffic flow dynamics are explained in terms of basic variables, such as flows, densities and average speeds in the continuum models. Usually, these models are derived by drawing the analogy between the vehicular flow and the flow of continuous media like fluids or gases. Specific relationships that describe the average properties of traffic flow macroscopically, like the one linking speed and density complement these models. A small number of equations that are quite easy to handle are generally used in continuum flow models. The dynamics of density, flow and speed are described by most of the continuum models. The number of vehicles occupying a unit length at a given point of time is called density. The number of vehicles passing a cross-section during a particular time span is termed as flow. The speed (average speed) of vehicles is described by the relationship q = ku. Partial differential equations of speed variance or traffic pressure are also used in some continuum models. Hoogendoorn and Bovy  gives a comprehensive review of continuum flow models. Most continuum models assume that all traffic entities are homogeneous in nature, which does not hold well in mixed traffic conditions. Development of continuum models for mixed traffic became prominent only in the twenty-first century. Modeling multi-class flows across multiple lanes [13, 50, 88] was the major focus. A comprehensive list of major macroscopic models developed till date for homogeneous and heterogeneous traffic is presented in Table 1. The dynamic interactions that take place between drivers of different vehicle types have not been considered while the diversity of vehicle types has been studied explicitly. Ignoring side by side movement of drivers which might cause significant errors in density predictions is the major limitation of this category of models. In a nutshell, the basic premise underlying macroscopic modeling approach is, under identical traffic conditions, all drivers behave similarly. However, this hypothesis dies the death of a thousand qualifications in mixed traffic conditions where drivers have varied capabilities depending on the type of vehicle they drive. Also, the non-lane based movement behavior of drivers’ makes these models unsuitable for describing mixed traffic conditions. To overcome these difficulties, researchers initiated modeling various behaviors exhibited by drivers at an individual level which gave rise to the whole new spectrum of microscopic models. The behavior of drivers’ at one’s own decision level, mutually giving rise to amassed traffic flows is captured by microscopic traffic models. Different factors related to driver-vehicle combination, traffic conditions, infrastructure conditions and external situational factors influence the behavior of drivers’. Various microscopic models have been proposed over the years to relate the observed driving behavior dynamics to the parameters that describe these conditions. Various driving sub-tasks are often differentiated while developing microscopic models. Table 2 provides a classification of these tasks. Most commonly, the driving behaviors like keeping-up the speed, acceleration, keeping a safe distance with the leader vehicle fall in the category of longitudinal tasks; while the lateral tasks include lane changing and overtaking behaviors. While modeling the longitudinal interactions sub-task has received quite a lot of attention, the lateral interaction sub-task still remains a point of exploration. 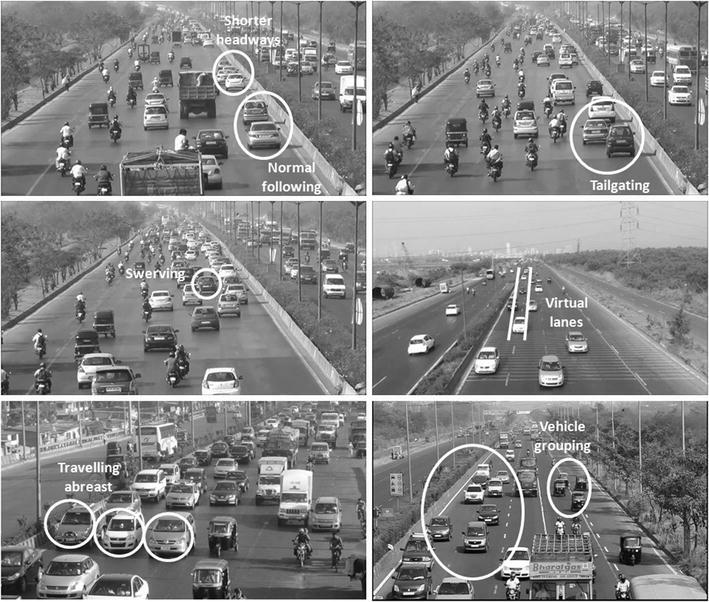 A broad classification of different car-following and lane-changing models is shown in Fig. 3. 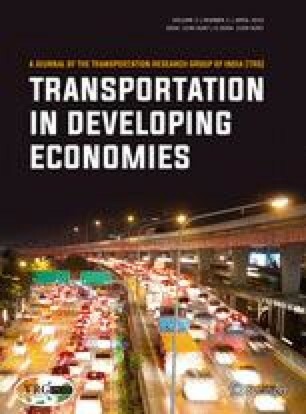 An extensive review of these driver behavioral models developed for both lane-based and non-lane based traffic conditions will be presented in the forthcoming sections after understanding the advantages of microscopic approach over other categories and identifying the data required for developing them. In general, microscopic models require more rigorous and detailed data from real traffic streams and they also consume considerable amount of time. To overcome these difficulties, hybrid mesoscopic models were developed by researchers taking into account the advantages of both macro- and micro-scopic approaches. A hybrid of macro- and micro-scopic models are the mesoscopic models which in general model the dynamics of groups or platoons of vehicles and describe the interactions between these clusters using mathematical equations. Three well known examples of mesoscopic models, headway distribution, cluster, and gas-kinetic continuum models are reviewed here. The difference in passage times of two consecutive vehicles is defined as the time-headway. These time-headways are usually presumed to be identically distributed independent random variates. As the distribution of headways of all individual vehicles is described by neither explicitly considering each of them nor tracing them separately, the headway models are considered mesoscopic in their sense. A semi-Poisson model by Buckley  and a Generalized Queuing Model by Branston  are some typical examples of headway distribution models. Different probability distributions to draw time headways of the lead and following vehicles separately are used in mixed headway distribution models. Headway distribution models are criticized for neglecting the role of traffic dynamics. Moreover, all vehicles are essentially the same is the major assumption behind these models, which means the probability distribution functions are independent of traveler type and vehicle type. The role of clusters characterizes the cluster models . A set of vehicles that share a particular property is called a cluster. Size and velocity of clusters are the most important aspects. As a cluster can grow and decay, its size is a dynamic characteristic. All clusters are homogeneous in their nature as within cluster traffic characteristics like headways, speed differences, etc., are usually not considered explicitly. Instead of explaining the dynamics of individual vehicles, Gas kinetic models consider changes in velocity distribution functions of a traffic stream. First of these kinds of models was proposed by Prigogine et al. . The dynamics of reduced Phase-Space Density (PSD) are generally described by these models. The probable number of vehicles present at an extremely small region driving with a specific velocity at a given instant is called the reduced PSD. Borrowed from the discipline of statistical physics, the concept of reduced PSD can be regarded as a mesoscopic abstraction of macroscopic traffic density. The assumption that the speeds of slowing-down vehicles are independent of the speeds of hindering vehicles is the major drawback of this model. Also, vehicle class homogeneity is assumed while modeling. A multi-class gas-kinetic model describing the dynamics of Multi-class Phase-Space-Density (MUC-PSD) was developed by Hoogendoorn and Bovy  to account for heterogeneity among vehicle classes. The presence of different user-classes results in the asymmetric slow-down process of fast moving vehicles, which means that the user-classes that are relatively faster catch up with the vehicles of slower user-classes. Similarly, a multi-lane, multi-class phase-space density (MLMC-PSD) model for lane based heterogeneous traffic with multiple lanes was also proposed by the same authors. The interactions between fast and slow moving vehicles along with the possibility of a lane change were captured by this model. In this model, two terms of interaction, passive when viewed from the standpoint of blocking vehicle, and active when viewed from the standpoint of blocked vehicle were incorporated. For each user class in a specific lane at a particular instant driving with a certain velocity and aiming for a higher velocity, the phase-space density was defined. A gas-kinetic model specific to multilane traffic flows was developed by Helbing  also. Although lane-changing is explicitly considered, the approach was similar to that of Paveri-Fontana . Velocity diffusion term, lane-changing term and rate of vehicles entering and leaving the roadway were considered additionally in this model in contrast to that of Paveri-Fontana . A comprehensive list of major mesoscopic models developed for homogeneous and heterogeneous traffic is presented in Table 3. Various problems arise with the existing mesoscopic models when applied to mixed traffic flow modeling. The linear measures of density that take into account only the longitudinal headways, for calculating the Phase-Space-Density are insufficient. Also, different vehicle classes in mixed traffic streams have wide variations in their speeds. For instance, at high densities, slow moving vehicles obstruct the flow of all other fast moving classes. With each approach having its own merits and demerits, there is no definitive superiority of one over the others. When the available model building time and the hoarded resources are too limited for developing a microscopic model, it is suggested that macro- or meso-scopic models be used. However, it is difficult to resist the conclusion that, the twenty-first century known for its technology and resources enables the modelers to go as microscopic as possible, even to a nanoscopic level, if it may be said so, in analyzing and modeling any system. Moreover, microscopic approach seems to be a viable option in modeling mixed traffic systems for the following reasons. Quite often, researchers made simplifying assumptions while developing macro- and meso-scopic models like the homogeneity of vehicle classes and drivers. Microscopic approach, on the other hand is viable to model the individual driver behavior and vehicular movements. Thus, the assumptions of homogeneity of vehicle classes and drivers can be relaxed. Even the multi-class macro- and meso-scopic models are unsuitable to represent mixed traffic flows as the interactions among different vehicle classes are not modeled explicitly and predicted densities are based only on longitudinal interactions. Furthermore, the dependency of driving behavior on surrounding traffic conditions may not be described by these models. On the other hand, major advantage of microscopic approach in the context of mixed traffic flow modeling is in its ability to capture the interactions of different vehicle types, the effect of surrounding traffic characteristics on driving behavior and, to model the time varying dynamics of traffic streams depending on individual driver behaviors. Though microscopic modeling is a better approach for describing mixed traffic systems, it requires more intensive and detailed data to understand the behaviors exhibited by individual drivers under various traffic conditions and to develop efficient behavioral models. The performance of a microscopic model highly depends on the accuracy of data obtained. With data being such a necessity, it is hard to fathom that the availability and standardization of this is not in a stage as it should be, especially for conducting mixed traffic driver behavioral studies. The major reason behind this would be the lack of proper understanding of how drivers behave in mixed traffic conditions. Hence, different behaviors exhibited by drivers while maneuvering in mixed traffic are explained first. Subsequently, the traffic related data realized by different researchers to develop behavioral models are reviewed. Different data collection methods and extraction tools available in the literature are discussed next. Finally, the improvements or the need to develop a novel data extraction tool is highlighted. As discussed earlier, presence of different vehicle types and weak lane discipline are the major features that characterize mixed traffic. It is commonly observed that due to weak lane discipline, drivers maneuvering in mixed traffic streams exhibit some peculiar patterns such as maintaining shorter headways, tailgating, swerving, and filtering (Fig. 4). Drivers in mixed traffic are likely to maintain shorter following distances compared to the drivers in lane-based conditions. This is because; drivers in mixed traffic have the option of tailgating a leader vehicle by aligning to one of its lateral edges. This behavior may shorten the safety gap. As and when the drivers recognize the possibility of colliding with a leader vehicle, they swerve off from the current position. This swerving or weaving behavior of drivers’ gives rise to integrated longitudinal and lateral movements. While drivers weave in and out of the traffic, it seems that they form virtual lanes for themselves to filter off through the clearances between slow moving vehicles. The peculiar driving patterns described above can be modeled by collecting empirical data from real traffic streams. Factors influencing driver behavior, methods of data collection and tools available for data extraction are discussed here. One of the major challenges in driver behavioral modeling lies in identifying the factors that describe the typical driving behaviors and to overcome the difficulties when they are to be incorporated in the corresponding behavioral models. Different factors that affect drivers’ behaviors can be classified as individual and circumstantial factors. The former are ‘unvarying’ attributes of a driver and vehicle, such as age and gender, education, physiological characteristics like reaction time and impatience levels, aggressiveness or risk-taking propensity, cognitive or managerial skills like fore-seeing and intellectuality, vehicle characteristics like the size of a vehicle, and vehicular performance attributes like engine power and maneuverability. The circumstantial factors vary spatio-temporally which depend on the traffic state surrounding a driver. They can be either associated to a specific driver or the surroundings in which the vehicle is driven . Important circumstantial factors are weather, visibility, noise level, network characteristics like road type, number of lanes, access type and grade, traffic laws with respect to limiting speeds, presence of video-cameras, traffic signs, traffic markings, traffic signals and finally the traffic stream characteristics and their dynamic properties like congestion level, type, speed and acceleration of surrounding vehicles. Rules governing the safety aspect are followed by drivers so that the accident scenarios need not be created. The time taken by the drivers to perceive the need to reduce their speed and react by braking determines the distance maintained by the follower with the leader. The stimulus which is a function of velocity difference with respect to the lead vehicle and a sensitivity parameter in terms of the spacing determine the drivers’ response. Drivers in car-following regime react only to the vehicle in front. While changing lanes, drivers respond only to vehicles in their immediate vicinity. Since no sole model can take into consideration all the aforementioned exogenous factors in a comprehensive manner, the assumptions discussed above lessen the number of parameters to be regarded while building a model and thus simplifies the task of calibration. However, the traffic modelers are always confronted with challenge of using adequate number of parameters to precisely describe the driving behaviors while still giving due consideration to keep the model sensible in the aspects of implementation and calibration efforts. Ranney  summed up the significant factors used in the currently available car-following behavioral models. They are: time or distance headway, relative velocity with respect to the leader vehicle, extent to which the following vehicle tracks the variations in velocity of the leading vehicle, speed of the traffic stream, the time for which a vehicle sustains in a particular driving state, whether car-following is preferred or obliged and finally, the road curvature. The effect of first three factors was reported pragmatically, while limited practical studies were performed to test the influence of the other four factors [69, 80]. Moridpour et al. summed up the significant factors included in the existing lane-changing models. They are: front and rear space gaps in the current, target and alternative lanes, velocities of the lane changed vehicle, and density in the current, target and alternative lanes. Summing up, factors that influence the driving behavior are mainly related to traffic characteristics and their dynamics in the immediate neighborhood. These traffic characteristics can be acquired by obtaining trajectories of vehicles traversing in a stream. Various data collection methods used for obtaining trajectories of vehicles are discussed here. Trajectory data of vehicles can be obtained either by floating-car method or video recording method. While the former employs vehicles equipped with sensors to measure movements and interactions of targeted vehicles, the latter uses video cameras fixed at elevated positions to record the vehicular movements. The advantages and disadvantages of these two methods are reviewed here to ascertain their suitability in obtaining trajectory data. Compared to video recording method, data processing is simpler in floating car method . Video recording can obtain a sequence of still images for which a time-consuming procedure has to be employed to get the required parameters, whereas the floating-car method can directly collect useful parameters depending on the sensors employed. Another advantage of this method is, the instrumented car can be equipped with a wide range of sensors, including camcorders. Despite these merits, this method has some limitations. Data can be collected only from a limited number of instrumented vehicles. Drivers under surveillance could behave differently than usual. Data collection ability of this method depends on the type of sensor fitted on instrumented vehicle as each sensor can capture only certain type of information. Thus, many sensors have to be employed to get all the required traffic related information. This makes the whole data collection process expensive. Thus, many traffic modelers use video recording method to collect traffic data. Trajectories and size of all vehicles can be recorded simultaneously using video recording method. Video footage can be reviewed and examined repeatedly if necessary, to guarantee the quality of data extracted. In addition, it is an unintrusive and naturalistic method which ensures capturing the natural driving behavior. The data collected are not affected by the presence of researchers. However, extracting trajectory data from the video footage is an extremely labor-intensive process. According to Taylor and Young , the extraction process can take up to six times as long as the real time recording. Even this seems to be an underestimate. Ahmed  reported that an hour of video footage requires 1800 person-hours to process. It is also understood that the quantum of work depends on the types of data required and traffic conditions. Another disadvantage of this method is that only a limited length of survey stretch, around 200 m  to 400 m  can be recorded depending on the resolution of images and field of view of the camera. The requirement of an elevated position is also a limitation of this method. When evaluating different data collection methods, accuracy of the data acquired is an important issue. However, it is difficult to compare the accuracy of data obtained by the above discussed methods. The reason being, accuracy of data collected by floating-car method depends on the equipment used. Therefore, comparison with respect to their abilities in obtaining trajectory data of all vehicles simultaneously is made here. With floating-car method, the types of data that can be collected depend on the ability of the sensors fitted on the instrumented vehicle. An extra data type will need an additional sensor, which means, it is difficult and expensive to obtain traffic characteristics required for driver behavioral studies. For example, detecting trajectories of all vehicles in the vicinity of a subject vehicle. On the other hand, the strength of video recording method lies in recording everything that happens in the traffic stream at any given point of time and space. This means, movements of all vehicles can be captured simultaneously. Moreover, video cameras are comparatively simple and affordable. Therefore, video recording method seems to be suitable to obtain the data required for developing driver behavioral models. However, accuracy of this method depends on pixel resolution of video images. Accordingly, the trade-off between pixel resolution and field of view has to be considered. For example, a telephoto image provides a high resolution but has a limited survey area whereas a wide angle image accommodates more area but has a limited resolution. Therefore, a high definition camera with a large focal length factor would be able to provide good quality data. Different extents of accuracy, ranging from 0.3 to 1.3 m have been reported in the literature [1, 27, 32, 38, 42]. If data accuracy can reach such a standard, it should be sufficient for developing driver behavioral models. Unlike floating-car method, the video recording method needs an efficient data extraction tool to obtain the trajectories of vehicles. Trajectories of vehicles from video images can be extracted either manually or by using an automatic image processing technique. Although an image processing software can save lot of time and cost, this technique for detecting vehicles which are mutually overlapping (occlusion) in the video images is still under development. Meanwhile, some semi-automated trajectory extraction tools like Autoscope  and VEVID  were developed. However, these tools may not be suitable for extracting trajectories of vehicles in mixed traffic conditions due to the non-lane based movement behavior of drivers’. TRAZER  is the only available tool for trajectory extraction in mixed traffic conditions till date. However, its accuracy is less, even in providing the macroscopic parameters. Another setback of this tool is the length (only 50 m) for which a vehicle can be tracked. Such a short tracking length would not serve the purpose of obtaining data required for driver behavior modeling. Hence, it may be inferred that an efficient trajectory extraction tool is still a major challenge. Moreover, it appears that fully automated data extraction tool may not serve the purpose in mixed traffic conditions. The major reason behind this supposition is, wide variations in physical size of vehicles and non-lane based driving behavior aggravating the problem of occlusion. Also, the inability of present day fully automated extraction tools to provide trajectories of vehicles for a longer length and duration lead us to this conjecture. The factors that influence drivers’ perception and decision making are mainly related to traffic characteristics and dynamics in their immediate neighborhood. These traffic characteristics can be acquired by obtaining trajectories of all vehicles simultaneously. For obtaining the trajectory data, video recording method seems to be a viable option compared to floating-car method because of its monetary advantages and its ability to provide naturalistic driving behavior data. However, accuracy of this method depends on good video resolution which can be achieved by using a high definition camera. Moreover, extracting data from video footage is an extremely labor-intensive process. Though fully automated data extraction tools can save considerable time and cost, it appears that wide variations in the physical size of vehicles and non-lane based movement behavior of drivers’ in mixed traffic conditions are the major hurdles in developing one of its kind. Hence, developing a semi-automated traffic data extraction tool would be a better option. The objective behind understanding data needs and reviewing various data extraction tools was to arrive at a solution to obtain good quality trajectory data by means of which efficient driver behavioral models can be developed. Often times, the behavioral models proposed to describe mixed traffic conditions stemmed out of the basic principles employed in development of homogeneous traffic models. Therefore, it is worthwhile to understand the undergirding principles of lane based driver behavioral models to develop comprehensive models applicable for mixed traffic conditions also. Fundamental driver behaviors can be modeled using two behavioral models, car-following and lane changing. Car-following is the process by which a driver trails another driver in close vicinity. Lane-changing is the process that describes how drivers change a lane. These two fundamental behavioral models are discussed here, and their strengths and weaknesses in describing the driver behaviors observed in mixed traffic conditions are identified. Several car-following models found in the literature can be classified into three broad categories, the stimulus response models, collision avoidance models and psychophysical models. The models which describe the response of drivers to various stimuli such as variations in distance and speeds relative to the leader vehicle considering a fixed reaction time belong to the category of stimulus response models. These models are pertinent to fairly congested traffic flows where overtaking possibilities are small and drivers are forced to follow the vehicle in front. Drivers do not want the gap in front of them to become too large so that other drivers can enter it. At the same time, the drivers are generally inclined to keep a safe distance. A series of studies conducted at the General Motors research lab by Chandler et al. , Gazis et al. lead to the development of one of the most popular models named the General Motors (GM) nonlinear model or sometimes referred as GHR (Gazis–Herman–Rothery) models. This model is based on the intuitive hypothesis that a driver’s acceleration is a function of relative speed and spacing. Though GM models are capable of describing the behavior of drivers’ more realistically, the following limitations may make it unsuitable for modeling the mixed traffic flows. It assumes that the stimulus as well as the distance headway can be perceived precisely and that the driver can tune the response precisely . Interaction between longitudinal headway and lateral position is completely ignored. Also, some behavioral patterns of mixed traffic drivers like oblique following and maintaining a shorter headway when aligning to one edge of the front vehicle may not be described. Considering the freedom of lateral movements that drivers have in mixed traffic, it is uncertain whether these models can efficiently describe the swerving and filtering phenomena. The collision avoidance principle tends to be adopted by most drivers’ while traversing in mixed traffic. Considering the assumption on which this model is developed, the tailgating behavior of drivers in mixed traffic can be described. It is also easy to modify and incorporate the vehicle-type dependency factor to address the issue of vehicle-type dependent following behavior of mixed traffic drivers. Whether drivers in mixed traffic exhibit the oscillating phenomenon? Often times, it is observed that the drivers make quick lateral movements to avoid collisions by crossing the deceleration perceptual threshold instead of applying brakes. Aligning to one edge of the preceding vehicle could be a more comfortable lateral position for a driver in mixed traffic conditions. Thus, making a lateral movement is more likely to be the option of drivers than decelerating. Of various car-following models reviewed, collision avoidance based model seems to be appropriate for modeling the longitudinal movement behavior of drivers’ in mixed traffic conditions. Collision avoidance principle tends to be adopted by most drivers while traversing in mixed traffic streams. However, vehicle-type dependency factor should be incorporated into these models to capture the longitudinal movement behavior of mixed traffic drivers. Lane-changing is another fundamental behavior of drivers’ to be described, for which different models are available in the literature. Lane-changing models describe the lateral movement behavior of drivers. Such behavior consists of two steps, the lane selection process and the execution process. These two steps are modeled by lane selection models and gap acceptance models respectively. Rule-based models are easy to understand and adjust for practical applications. However, there is no solid framework for calibrating the model parameters and it is difficult to capture the interactions between the rules. However, interaction between different rules plays a very important role in capturing the mixed traffic drivers’ lateral movement behavior. Although fuzzy logic models are capable of capturing the humans’ imprecise perception during lane changing, difficulties arise while abstracting the fuzzy rules. These problems aggravate in mixed traffic conditions as numerous fuzzy rules have to be abstracted if all peculiar behaviors exhibited by drivers during their lateral movements are to be modeled. As lane selection process is a kind of discrete choice based on the competition between utilities of driving on different lanes, random utility modeling may be suitable for its description. In addition, a neat approach for model calibration is also provided by this technique. Nevertheless, the model specification and calibration process for developing random utility models is resource-demanding. In a nutshell, random utility based models seem appropriate for capturing the lateral movement behavior of mixed traffic drivers as vehicle-type dependent driving behavior can be incorporated into this modeling framework without much difficulty. Also, it provides an efficient approach for calibrating the models. However, before applying this modeling technique, the suitability of traditional lane change definition in mixed traffic conditions should be verified as drivers in these conditions perform non-lane based movements. After selecting a lane, drivers search for an acceptable gap to execute their lateral movements. Requirements of the lateral width of a gap are different for drivers in mixed traffic conditions. The lateral width of a gap needed for a car driver is generally equal to width of the lane. However, the lateral width of a gap that a small sized vehicle driver requires is a narrower one. Gap acceptance cannot be dealt as a separate step in modeling lateral movement behavior of drivers in mixed traffic conditions as they tend to perceive both speed gain and space gap simultaneously, before making a lane change decision. To summarize, the lane-changing process comprises many latent tasks of drivers’ and hence is more complex than car-following behavior. However, most existing models proposed to capture this behavior are strictly rule-based, where it is assumed that drivers always follow a sequence of if–then rules prearranged at different decision-making levels. Moreover, they assume that drivers are both consistent and homogeneous. These assumptions are not realistic, especially in mixed traffic conditions. Mixed traffic drivers exploit their maneuvering capabilities depending on the type of vehicle and take advantage of weak lane discipline. Apart from these, the logical relationships that cover the whole of driving process, that is, the effect of lane changing on longitudinal acceleration and vice versa received almost no attention. However, in mixed traffic conditions, there exists a huge interaction between longitudinal and lateral movement behaviors as drivers always look for simultaneous possible lateral movements while progressing longitudinally. This gives rise to integrated driving behavior. As discussed, car-following and lane-changing are the two fundamental driving behavioral models required for traffic microsimulation and considerable efforts have been put in developing them. Conventionally, car-following and lane-changing were alienated into independent models. However, drivers in reality make integrated car-following and lane-changing movements. These integrated movements are more predominant in mixed traffic conditions as drivers look for opportunities continuously to filter off through the gaps available, but at the same time maintain a safe distance with the vehicle they are following. Thus, during the past decade, there was an inclination towards bringing the car-following and lane-changing models into one integrated mechanism. In fact, many researchers aspire to put together all driver behavior components into one scheme. However, a general model tailored to any situation seems still not, perhaps never, available. Different approaches generally adopted in the existing simulators and the possibilities of employing some advanced theories to model the integrated driving behavior in mixed traffic conditions are discussed here. Most of the existing simulators (VISSIM, PARAMICS, AIMSUN) employ rule based sequential/hierarchal process. The following example illustrates how a lane-change maneuver gets initiated within a rule based interaction framework. After the initiation of a lane-change, the driver executes it in a single time-step. However, it is a well known fact that lane-change execution takes considerable time to get into the desired lane as illustrated in Fig. 5. In this process, the lane changing decision does have an effect on longitudinal acceleration. Nevertheless, this cannot indeed be captured by a rule based model. They employ car-following and lane changing algorithms in isolation without considering the effect of one on the other. This creates potentially incorrect situations. For example, accelerations are predicted separately for longitudinal and lateral driving movements. This generates vehicles that leave more-than -enough headway when following another vehicle, nevertheless will cut-off a neighboring vehicle in the adjacent lane, accepting a minimal gap. They do not consider how a driver scans the roadway, identifies stimuli, and formulates a reaction in an integrated manner. To overcome these drawbacks, researchers explored various concepts available in field theory, social force theory and dynamical systems theory. The field theory originated on the heels of social behavioral theory which belongs to the discipline of psychology. This theory was first proposed by Lewin . It was developed initially for replicating the societal situations, nevertheless made a noteworthy contribution to the fields of community science, psychology, public psychology, organizational progress, process managing, and transformation management. Field theory is described as a method for investigating causal relationships. It takes into consideration two types of forces, those that let movements towards a goal (helping forces), or those that obstruct the movements towards a goal (hindering forces). These forces are brought about by exterior stimuli felt by the agent. This theory shows the transformation in an individual’s life sphere, depending on how the individual personalizes external stimuli. It also posits that the behavior must be a derivative of the totality of affiliated facts and these affiliated facts make up a dynamic field. Therefore, the condition of any element of the field depends on every other element of it. Chakroborty et al. , Berthaume et al. explored the possibility of applying field theory to construct a conceptual framework for describing the driver movements. Each driver or an individual has a life space, or field, that exists around them. In every individual’s life space, there exist the external stimuli. Each stimulus has a different set of forces allied with it. Forces can be multiple and they can have either an attracting or a repelling nature. The way in which an agent will behave or react is dictated by the cumulative effect of these forces. The perception bubble and the forces around a vehicle i are depicted in Fig. 6. From the foregoing discussions, it can be understood that, a microscopic model developed using the field theory could potentially find application in addressing prominent issues like integrated driving behaviors. However, before any such model is adopted, in-depth analyses and calibrations must be performed. Also, such models should be verified and validated rigorously. Analogous to field theory, social force theory was also adopted by researchers to model the driving behavior. Helbing and Molnar  were the first to introduce the social force concept to explain the behavior of pedestrians. Social forces include the forces that make a pedestrian, change direction and speed in order to reach a specific target. These forces are classified into three groups, driving forces, repulsive forces and attractive forces. The driving force helps pedestrians to move in a desired direction. The repulsive forces from other vehicles or objects help the pedestrian to avoid collisions with other pedestrians or static obstacles. The attractive forces from other people or objects help the pedestrian move towards attractive objects. Later, this concept was extended to analyze the movement of vehicle drivers. Nguyen and Hanaoka  developed a social force model to describe non-lane based movements of motorbike drivers. Huang et al. also proposed a social force model to simulate the behavior of vehicles on a two-dimensional space. This model was used not only for motorbikes, but also for cars. Though social force models make it possible to describe driver movements in both longitudinal and lateral directions simultaneously, it is complex in terms of huge number of parameters needed to calculate the components of each force. These parameters increasingly multiply when applied for vehicle-type dependent driver behavior modeling. Hence, researchers started looking at simple and effective dynamical systems which can comprehensively represent the integrated driving behavior. Scores of dynamical systems exist in various fields. The simplest of them is the spring-mass-damper system. Yan and Long  were the first to develop a spring-mass analogy based car-following model. Their approach uses the concepts involved in the dynamics of spring-mass system to describe the characteristics of acceleration or deceleration of a follower vehicle under the known condition of the leader vehicle. When the distance between the leader vehicle and the follower vehicle is greater than the equilibrium length of the spring, acceleration of a driver is triggered. On the contrary, when the distance is less than the equilibrium length of the spring, deceleration of a driver is triggered. Following this, Wang et al. developed a spring-mass analogy based model to capture the starting and stopping processes of drivers. However, both these researchers did not consider the lateral interaction component in their model formulation. When applied to mixed traffic, many rules and parameters have to be incorporated if rule-based models or, the models developed using the concepts of field and social force theories are adopted. On the other hand, spring-mass-damper dynamical system analogy based approach offers the advantage of using a simple linear equation with minimal number of parameters. To implement and assess the capabilities of driver behavioral models in representing a traffic system on a larger scale, a simulation framework is necessary. Simulation frameworks can be either event based or time based. Only when an event occurs, the status and location of each unit of traffic are updated in the case of event based simulation. The condition of each vehicle is tracked at every point of time and accordingly, the required statistics are collected in the case of time-based simulation. Almost all the existing traffic simulation models (VISSIM, AIMSUN, SUMO) are time based, because the driver behavioral models such as car-following and lane-changing require updating of driver positions at small time steps. The longitudinal movement (car-following) models existing in these simulators are space continuous. However, the lateral movement (lane-changing) models are discrete in their nature. Lateral movement within a lane is not possible with these models. If mixed traffic streams are simulated using such models, the lower speed vehicles quickly form a moving bottleneck on the road, which is very rarely the case, in reality. In general, fast moving vehicles overtake slow moving vehicles at the earliest opportunity by making lateral movements within a lane. A few frameworks existing in the literature which make the space discrete lane-changing models suitable for capturing lateral movements even within the lanes are discussed here. Nagel and Schreckenberg  proposed the first CA model. In their model, the space on the road which is two dimensional is divided into a lattice of similar sized cells, each 7.5 m long, or approximately the length of one car. Using the four predefined routes and the four regimes which include acceleration, deceleration, randomization and updation, the vehicles move through the cell raster. The overlapping of cells is not possible and the each cell can occupy only one vehicle at a time. For this very reason, the original CA model was not able to represent the mixed traffic. A few extensions of the original CA model have been suggested in the literature  to make it possible to include multiple vehicle types. One option for accommodating different types of vehicles is to construct a lattice of cells that are sized in compliance with the dimensions of the smallest vehicle and allow the vehicles to occupy more than one cell. Mallikarjuna and Rao  used this approach to describe mixed traffic conditions. In their model, the acceleration and deceleration properties of a vehicle type influence the length and on the other hand, the observed lateral spacing maintained by different vehicle type drivers’ determines the width of a cell. Another CA model was developed by Vasic and Ruskin  to represent car and bicycle traffic. In this model, a cell lattice with suitable cell sizes is created for each type of vehicle. Depending on the overlap or intersection of more than one type of vehicular streams, the cells in this model also overlap. The vehicular movement is then determined by the encroachment of the leading cells. A cell is encroached if it is occupied or any of the overlapping cells are occupied. It was only on narrow roads where the velocity of cars is affected by the longitudinal distance to the next leading bicycle, the lateral interaction between bicycles and cars was considered. The relatively complex lattice of cells majorly influences the complex interactions. Most extensions proposed to make CA models suitable for mixed traffic conditions was in terms of cell size to accommodate different vehicle types. However, when modeling mixed traffic conditions, not only the size of different vehicle types is important, but also the microscopic interactions between these vehicle types. Consider the filtering behavior for example. In the real world, the path for a vehicle to filter through is dynamically formed by the lateral clearances between vehicles. A CA model cannot mimic this dynamic behavior. Thus, it is possible to result in mis-estimating the microscopic behaviors of drivers observed in mixed traffic conditions. To overcome these difficulties, a continuous lateral movement model was proposed by Hossain and McDonald . Hossain and McDonald  used the continuous coordinate referencing technique. With coordinate based referencing, it is possible to represent all the vehicles in a single road link in a single list. Also, each vehicle can be tracked using the co-ordinates of one of its corners. The lateral movement model directs the movement of vehicles by first examining whether there is a desire or any necessity for making a lateral movement. If the vehicle has a wish or the existing conditions necessitate a lateral movement, the model determines the width required to move laterally and also searches for any vehicle that may have to follow it after that lateral movement is made. The vehicle under consideration is allowed to move laterally only if the predicted lateral position is ‘safe’ considering the speed and location of the new follower. The computed new lateral position of the vehicle is also stored in the vehicle record. The major challenge faced by this technique is, identification of the surrounding influential vehicles. To find the influencing vehicles, the whole road space available in the lateral direction is searched for, which increases the computational time significantly. Thus, a semi discrete approach, where a lane is divided into virtual lanes and the vehicles are tracked along these lanes instead of coordinates was adopted by some researchers. Falkenberg  proposed a model which is currently employed in VISSIM. In this model, the lateral position chosen by the driver in such a way that he has the maximum longitudinal time-to-collision. Given that two drivers stay on the same path maintaining their same speed, the time remaining until they collide with one another is defined as time-to-collision. To find this position, the available road width is divided by the drivers into virtual lanes . Taking into account some safe lateral distance, the drivers construct these virtual lanes from the left and right sides of the preceding vehicles on the roadway. The ‘type’ of both the vehicles and the ‘speed’ of the overtaking vehicle govern the lateral safety distance that a driver wants to keep while passing another vehicle. It is assumed that safety distance varies linearly with the speed. Taking into account the type of the vehicle and the longitudinal speed, a driver applies a lateral speed to move to a desired position from his current position. Thus, it seems possible to model the lateral movements within a lane using this approach. Also, the required computational power is relatively low compared to a continuous framework as the search for surrounding influential vehicles is by virtual lane rather than by the whole road width. However, the time-to-collision principle does not describe the microscopic details of traffic flow (overtaking and merging) sufficiently accurate from a single driver’s perspective. To describe the driver behaviors accurately in mixed traffic conditions, a behavioral model should be able to handle two situations not included in traditional car-following and lane-changing models: Drivers should be able to choose any lateral position within a lane and as far as the longitudinal behavior is concerned, it should be able to handle multiple leaders in the same lane. Discrete CA approach lacks intuitive appeal and its rules are not easily interpretable from the microscopic driving-task perspective to handle these behaviors. Continuous simulation framework needs high computing power as it adopts searching the whole road space in the lateral direction for identifying the surrounding influencing vehicles. Compared to these two approaches, the semi-discrete approach offers a better framework which is both computationally efficient (surrounding vehicles search by virtual lanes) and behaviorally robust (if good behavioral models are adopted). Data requirements: The surrounding environment variables that describe the subject vehicle and its relations with the neighboring vehicles, such as the subject speed, relative speeds and spacing with respect to the front and rear vehicles and lead and trailing vehicles in adjacent paths are important to understand and model the driving behavior. Trajectory data, which consists of the observations regarding the successive positions of vehicles at a higher time-resolution (usually one second or shorter) provides information on these variables. Thus, trajectory data of vehicles is of prime importance to carry out any driver behavioral study. Data collection: A wide range of technologies, such as aerial video shoots (quad copter), video cameras, GPS and cellular location information have been used to obtain the trajectory data. Data collection systems may be either dynamic (instrumented vehicles) or static (cameras). Data acquired by instrumented vehicles may offer the required data without the need to put in extra efforts for data extraction. However, these data provide only limited information about the driving environs. In many cases, only the information regarding the vehicle in front of the subject vehicle is observed. Therefore, while instrumented vehicles may seem to be a potential source of rich trajectory datasets, they are still not capable of providing the information on the required fundamental variables (e.g. lateral movement behaviour modeling requires observation of the vehicles in the immediate neighborhood). On the other hand, a fixed data collection system after employing a proper data extraction procedure can provide information regarding the position of the vehicle under consideration and its relations with the surrounding traffic environment. However, most of the existing datasets only cover short road sections, say 300–400 m long. The driving behaviors, especially those of lateral movements are to be studied for longer durations before and after executing them. Also, the effects of other factors like geometry, surface conditions, cannot be studied on driving behaviour if the section is too short as they remain uniform over the length. In addition, no information about the drivers’ characteristics and only partial information about the vehicle type (e.g. length and width) are available. To overcome these limitations, data should be collected from considerably longer sections with more variability in the vehicular and geometric characteristics. Data extraction: Trajectories of vehicles from video images can be extracted either manually or by using an automatic image processing technique. Although an image processing software can save lot of time and cost, this technique for detecting vehicles which are mutually overlapping (occlusion) in the video images is still under development. However, a fully automated data extraction tool may not serve the purpose in mixed traffic conditions. The major reason behind this supposition is wide variations in physical size of vehicles and non-lane based driving behavior aggravating the problem of occlusion, thus posing a major challenge to obtain trajectories for a longer length and duration. Hence, it may be inferred that an efficient trajectory extraction tool is still a major challenge. Driving regimes: A number of driving regimes have been incorporated in the driving behavioural models to represent drivers’ behaviour under varying situations. The evolution of acceleration models from simple car following to multi-regime models has resulted in the inclusion of free-flow acceleration as well as various sub-regimes of car following (e.g. acceleration and deceleration or responsive and non-responsive car following modes). Lane changing models include obligatory merging and courtesy yielding in addition to the traditional mandatory and discretionary lane changing behaviors. This trend is expected to continue so as to develop robust models that can represent a wide-ranging set of behaviors the drivers may exhibit in the real world. The introduction of many driving regimes arises the need for the definition of boundaries with which the behavior in active mode can be determined. For instance, headway thresholds are used to find out whether a vehicle is in car following or free-flow, and the circumstances that trigger mandatory lane change or obligatory merging are determined using various zones. However, these thresholds were often set arbitrarily or calibrated using informal procedures. Moreover, deterministic values of these thresholds were used quite often without giving due consideration to the heterogeneity in vehicle-type and driver population. Future models should be capable of not only explaining the behaviors in various regimes, but also have the capabilities to capture the margins and changeovers between these regimes. Hence, enhanced specifications and estimation approaches that can consider the regime boundaries as random variables and calibrate their distributions jointly with the other parameters of the models are very much necessary. Driver behavioral models: Compared to stimulus–response and psychophysical car-following behavioral models, collision avoidance based models seem appropriate for describing the longitudinal movement driving behavior in mixed traffic as most drivers tend to adopt the principle of collision avoidance while traversing a traffic stream. However, vehicle-type dependency factor needs to be incorporated in these models to describe the vehicle-type dependent driving behavior observed in mixed traffic conditions. Compared to rule-based and fuzzy-logic based lane-changing models, random utility models seem appropriate for describing the lateral movement driving behavior as the lane selection process is a kind of discrete choice based on competition between the utilities of driving on different lanes. However, separate models need to be developed for each vehicle type to address the issue of vehicle-type dependent lateral movement driving behavior observed in mixed traffic conditions. Integrated driving behavior model: Traditionally, car-following and lane-changing were alienated into independent models. However, drivers in reality make integrated car-following and lane-changing movements. These integrated movements are more predominant in mixed traffic conditions as drivers look for opportunities continuously to filter off through the gaps available, but at the same time maintain a safe distance with the vehicle they are following. Thus, during the past decade, there was a tendency to model car-following and lane-changing into one integrated mechanism. In fact, many researchers wish to integrate all driver behavior modules into one scheme. However, a general model adapted to any situation seems still not, possibly never, available. Hence, the possibilities of developing integrated models using the field theory, social force theory, and simple mechanics-dynamics theory could be explored. Of these, mechanics-dynamics theory (for e.g. a spring-mass-damper theory) could be the most viable option because of the simple mathematical forms involved in its formulations.